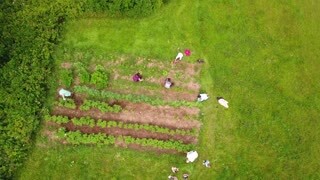 Organic vegetable community garden in early Summer. 1940s: America flag flaps in breeze; elderly man works in garden with hoe; several people work in large community garden. 1940s: Adults and children work in community garden; large flowering shrubs line neighborhood street; young woman cultivates garden with hoe. 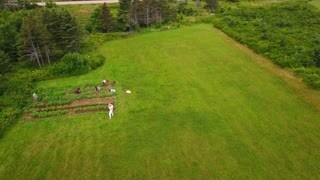 4K Community garden created & cared for by local volunteers. No people.